Being that our house is still pretty new (well, newly renovated), we still have a running list of projects to complete. Most of the projects are decorating-related except for yard projects, but we’ll discuss that another time. I love that we chose shades of gray as a base, but we’ve been so wrapped up in finding big pieces that we’ve really only added more gray, white and gold-ish neutrals. Pillows & Rugs // Here’s where the color comes in. Adding new pillows in different shapes, colors and prints is an easy way to change things up (and can be fairly cost-effective). I’m sort of leaning toward all things blue right now, which is becoming a really pretty accent in our house. We’ve also got rooms that desperately need some floor coverings, so a great rug that brings in the colors of the space can really pull everything together. And make sure to get a rug pad to keep it from slipping around when you walk, or in our case run/slide/drive toys over, on it. Candles // This is definitely something I like to change seasonally. In the Spring, I try to keep our windows open as much as possible so I want our house to always smell light and fresh. To change up my candles, I like Tanzanian Freesia or Provence Lavender, as a nice change from richer, maybe heavier scents. Random Decor // Every so often, I like to sort of review the photos in our frames and put in newer ones, especially of Jackson since he seems to change weekly! I also always keep my eyes open for unique “sit around items” to decorate our (still) quite empty bookshelves! 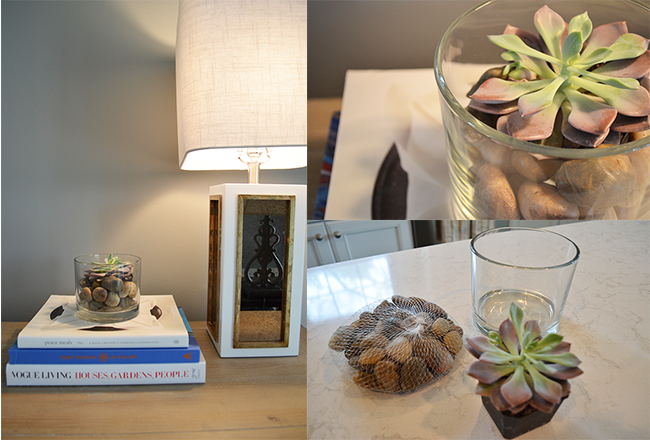 Succulents // These work great in a smaller, clear vase. 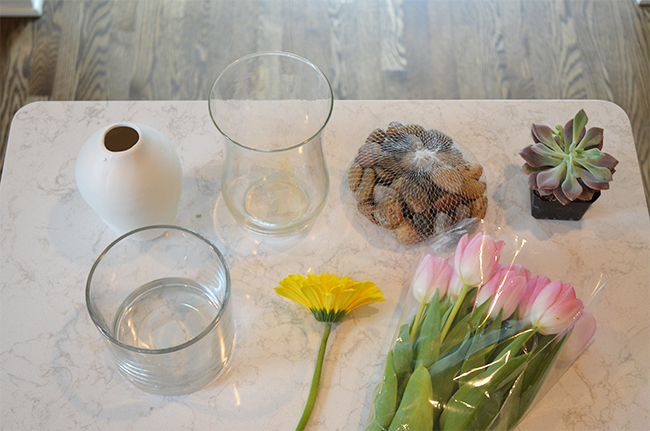 I usually pick up some vase filler and cover the plant container with them. To do this one, I tilted the vase on its side and lout in a handful of rocks along that side, lay the succulent on and then tilt it back up and fill in the spaces with more rocks. These are also awesome because they require very little maintenance and they last a good long time! Single Flower // My favorite place to put this one is a nightstand. The small, white clay vase is perfect for just a little bloom and a little green and it adds just enough color to brighten up your bedroom a bit. 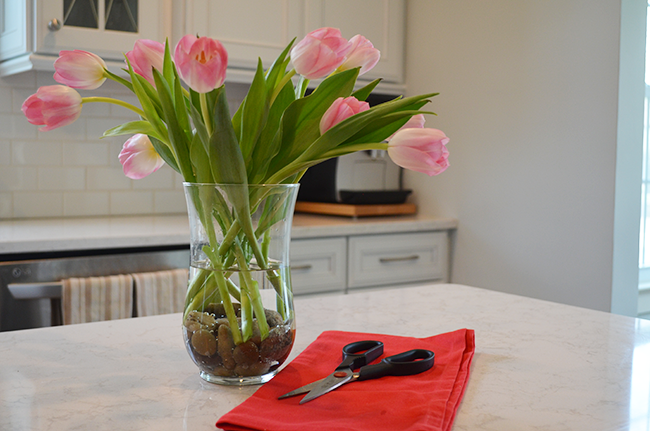 Just make sure you trim the stem of your flower when you bring it home and make sure to change the water frequently to help your blooms last longer! A Fresh Bunch // This is one that I’ll often put in my kitchen. I personally like sticking with one color and type of flower, because it is simple and chic. 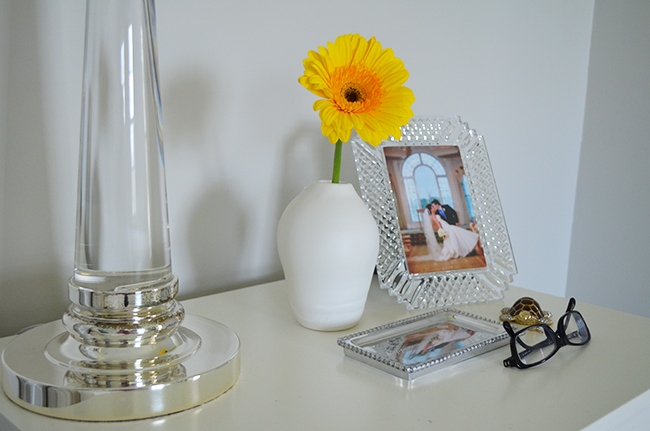 These taller, clear glass vases are so good to keep around – and this one is such good quality and at such a good price! I put a handful of rocks (these are vase filler, but I’ve also just grabbed them from one of the beds in our yard too) in the bottom and then trimmed my tulip stems before criss-crossing them in the vase. It’s a very natural look, but also just easy and beautiful. I also do this I receive an arrangement and have a few flowers that last longer than others. I mix those with some new flowers in the same color family to create my own arrangement! 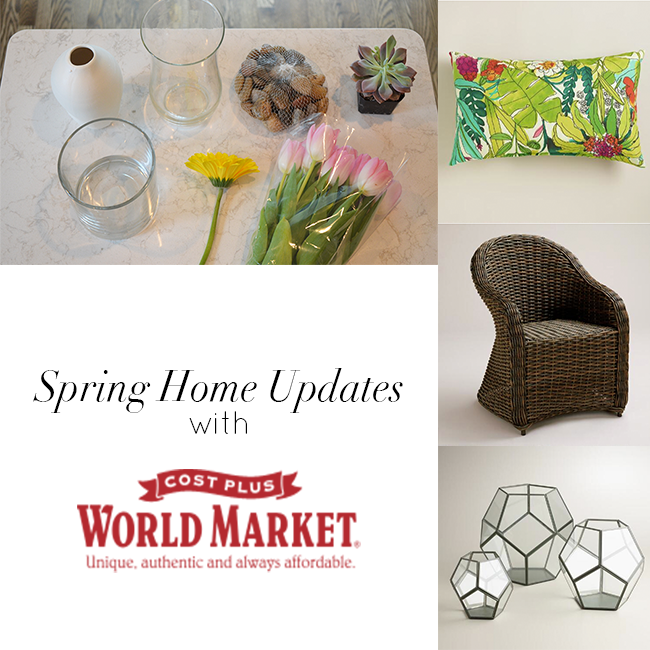 Another good reason to make some updates is because things are on sale and the World Market Friends & Family sale kicks off today! That means that EVERYTHING in this post is 25% off through Sunday with the code FFWEB.